The University is nestled like an oasis in Rajasthan's Thar desert. It is about 300 km west of Delhi , 125 km east of Bikaner and 230 km north of Jaipur (connected by rail and road). GVM has its own triad of helipads.GVM was founded in 1950, on a 1200-acre piece of land, in one of the harshest and most backward terrains. Acutely prone to droughts, hot and cold waves, epidemics and other travesties of nature, GVM has striven to alleviate the deprivations through various permanent and ad-hoc programmes of education, culture, livelihood, health and hygiene, vocations among others without any discriminationThe rich cultural and spiritual heritage of India and propagation of Gandhian ideals of Ahimsa, Sarvoday and Universal Brotherhood are given due importance in all regular as well as periodical programmes. 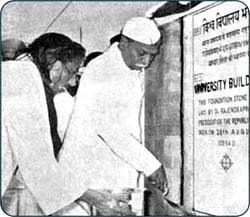 Dr. Rajendra Prasad, the first President of India, laying the foundation stone of GVM's University building in 1955. The founder Shri K.L. Dugar holds the mortar vessel. GVM has resident / non-resident students, from pre-primary to Ph.D. level. GVM was conceptualized and nurtured as a University. The studies in Education started in 1953, with Basic Teachers' Training College offering TTC course, as it existed then. In 1954, the course was replaced by Basic STC. The degree courses started in 1956, postgraduate in 1958 and the facility for Ph.D was added in 1968. The Institute of Advanced Studies in Education came into being under the Centrally Sponsored Scheme of Education in 1993. The new millennium heralded the dawn of a dream-come true. After an arduous toil of over fifty years, Institute of Advanced Studies in Education (IASE) of GVM was formally recognized as Deemed to be University by Govt. of India under Section 3 of the UGC Act-1956 vide notification F.9/29/2000-U.3 of 25th June 2002, and by UGC vide notification F.6-25/2001 (cpp-i) of 27th July 2002. IASE has had a glorious past.It has grown from strength-to-strength and its 50 years history is a saga of strides, struggles and successes. "Service with Sincerity" is our watchword and the motto is : "Gyan-bhanur-bhasatam" - "May the Sun of Knowledge Shine".